Well, the Cup started easily enough. I checked in for Maskwa with the R/C at the fundraiser dinner on Friday, the night before the race. I told them, checking, PHRF 3, yadda yadda yadda. I was told that they had changed the section bands to make things more competitive, and that we were in PHRF 2. I looked at their breakdown sheet for the section, and I said "Well, we rate 72, and the section break is at 67. That would make is Section 3." I was told that we were Section 2, as they had changed the section breaks, and they gave me a grey flag to fly for our section. I checked the list, and, well, they had grey for Section 2, and Blue for Section 3; guess that makes us Section 2! We went out on the racecourse on Saturday, and we saw some of our normal competition, who are faster than we are, with Section 3 flags. Uh oh... that's a bad sign. 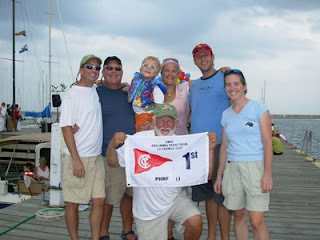 However, the Race Committee GAVE us that flag, and we were gosh darned well going to start whenever it was flying. We had a really good start, and as we were working our way up the course on leg #1, we noticed that as we tacked, the wind would shift in our favor. We crossed Jahazi about a boat length ahead, and as we tacked to lay the turning mark, we were at least 10 lengths ahead. Good sailing! We worked our way "downhill" under spinnaker, and no one seemed to be around us. We moved nicely up into the section that started ahead of us, and as we turned up to start leg #3, we started passing our section coming down on leg #2. Very interesting place to be! We were first boat to round every mark, and as we finished, we were barely caught by Jahazi at the finish. ONE second! However, they owed us at LEAST 3 minutes under handicap, so we were the clear winners of the section!